This is my mom in law’s basic sambar recipe for rice in which we use lady’s finger @ okra.Last week a reader mailed me to blog basic sambar & vathakuzhambu recipes.So i thought of sharing this recipe which might be useful for Tamil new year lunch menu too.I usually make vendakkai sambar & avarakkai sambar for no moon day and for festivals where we don’t use onions because this sambar tastes good even without onions.My mom also makes vendakka sambar but the procedure is completely different.Do click here to know my mom’s Nellai sambar recipe.This sambar is very easy to make and flavourful too.There is no grinding part.Hence bachelor’s also can give a try.We usually eat sambar sadam adding a few drops of ghee.It enhances the flavour of sambar and even kids would love to have it.For this sambar,u can replace lady’s finger with brinjal,Raw mango,drumstick or even Keerai thandu.But the quantity of tamarind varies for each veggie.In this post,lets see how to prepare Tamil nadu style basic sambar recipe with Lady’s finger. 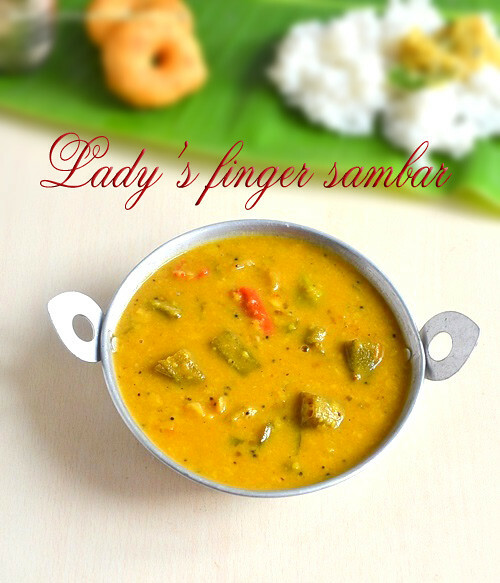 Lady's finger/Okra/Vendakkai sambar recipe - Basic south indian style sambar for rice ! In a pressure cooker,take the toor dal,turmeric,red chilli,curry leaves with required water.Cook till dal turns mushy. In the mean time,wash and pat dry the okra in a towel and cut into small pieces of 3-4.Peel onions,cut chillies and set aside. Soak tamarind in enough water and take the extract using 2 cups of water.Add sambar powder,turmeric powder,salt,hing and curry leaves.Set aside . In a kadai,heat ghee + oil and temper mustard,methi seeds,red chilli & curry leaves.Add the chopped lady’s finger pieces.Saute for a minute and then add onions and green chillies.Saute till onions turn transparent & lady’s finger shrink and skin turns slightly brown here and there.Then saute tomato pieces till mushy.Add 1 cup of water and allow the lady’s finger to cook well.When it is 3/4 th cooked,add the tamarind extract mixture. 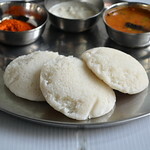 Add some hing and pinched raw curry leaves (please note we are adding hing & curry leaves two times).Allow the sambar to boil well for 5-10 minutes till raw smell emanates. 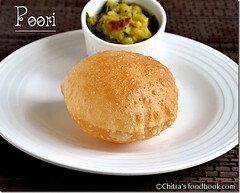 Now add the mushy cooked dal and boil for 2-3 minutes.Lastly before switching off the flame. Add chopped coriander leaves,boil for few seconds and switch off ! 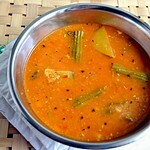 Cover the sambar with a lid and serve after 30 minutes to 1 hour for all the taste to blend well. Please reduce the amount of green chillies based on its size & spiciness.Use minimum 2. Sauting okra is very important else it will become slimy while cooking. 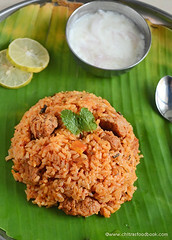 Please add less tamarind as vendakkkai has the tendency to absorb all the tanginess. 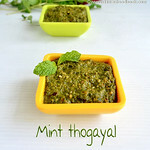 Adding coriander leaves for garnishing gives a nice flavor. 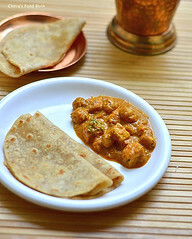 Use ghee for tempering as it gives a nice aroma. 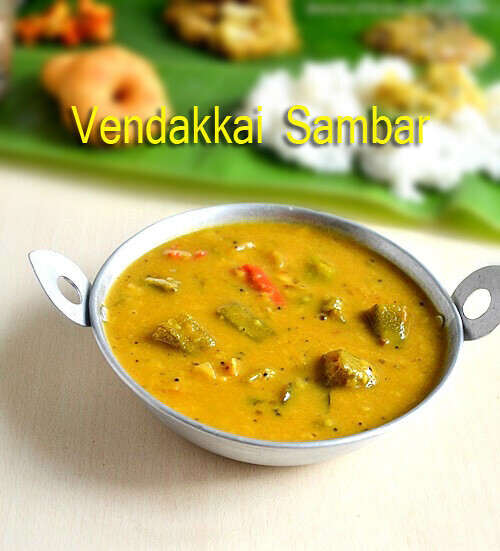 Enjoy this sambar with plain rice adding few drops of ghee with papad & poriyal as side dish.Tastes great ! 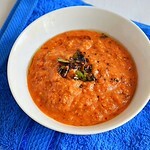 Nice looking sambar. Loved the presentation too. 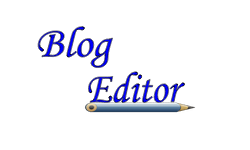 healthy sambar n stunning clicks!!! 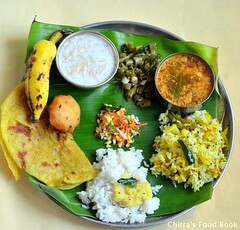 happy new year.. lovely sambar..
Nice clicks and the sambar looks delicious..
Vendakkai sambar is adored at our home too. 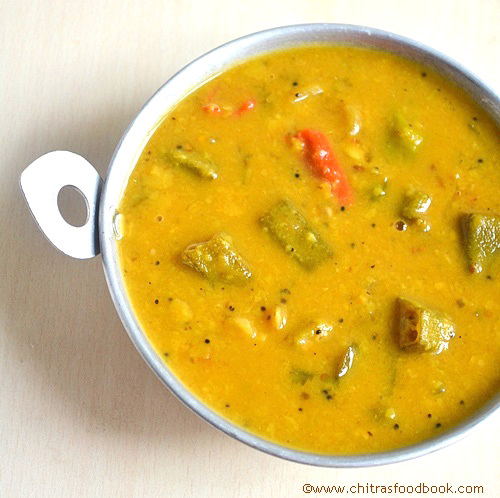 It is surprising isn't it, how each family has a special recipe for the same dish - sambar. 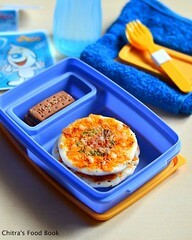 I am going to try it your way very soon.